You can print a list of meeting attendees and their response status (attending, declined, or no response). Open the meeting request from the Calendar. 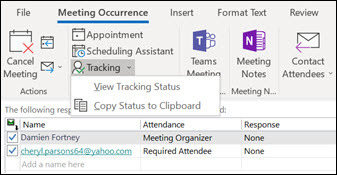 On the Meeting or Meeting Occurrence menus, click Tracking > Copy Status to Clipboard. Open Word or Notepad or a new email message, and then press Ctrl+V to paste in the tracking information.